This fall the Pickwick Theatre will debut an all-new classic film series at the art deco movie palace in Park Ridge. 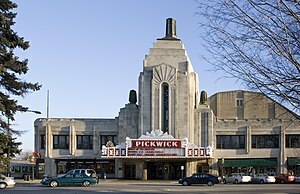 The Pickwick opened in 1928 as a vaudeville stage and movie theatre and was designed by architects Roscoe Harold Zook, William F. McCaughey and Alfonso Iannelli. The main auditorium is built to resemble an Aztec or Mayan temple and seats up to 1,400 people. Additionally film fans were already familiar with the theater, as “Siskel & Ebert & the Movies” featured the Pickwick’s marquee and 100-foot tower in the opening credits of their legendary television series. Now Matthew Hoffman is hoping to make the Pickwick a destination for cinephiles interested in classic films. He’s currently the assistant circulation manager at the Park Ridge Library and also its resident film historian. Previously he studied film at Columbia College before focusing on becoming a writer. After college, he was charged with hosting the LaSalle Theatre’s Saturday Night Classic Film Festival. At LaSalle he oversaw a revival of classic and rare cinema screenings, some of which aren’t easily available via retailers. He got the job after his Columbia College professor Scott Marks, who was running the LaSalle film festival prior to Hoffman, was hired to be Film Critic and Big Screen blogger at the San Diego Reader. Hoffman continued the festival until he decided to pursue his Masters degree. Then five years ago, the Park Ridge Library asked him to start a classic film series that has now expanded to the Pickwick. The Bugle talked to Hoffman about his plans for the Pickwick series and his love of cinema. The Bugle: How did the move to the Pickwick come about? Matthew Hoffman: Each spring, I do a film program for the Park Ridge library that runs from March to the end of May. One year, we did a film series that focused art deco in Hollywood film design called Spring Deco. Another series we did at the library was profiling swashbuckling films in Hollywood that was titled Crossed Swords. 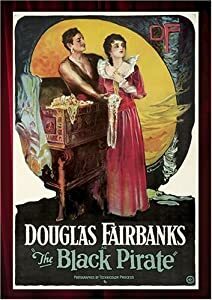 In the past, we’ve partnered with the Pickwick to successfully screen “The Black Pirate” (1926) starring Douglas Fairbanks and “The Adventures of Robin Hood” (1938) starring Errol Flynn. Because these screenings had a great turnout, the Pickwick Theater’s management took note of our success and told me he wanted to do a classic film series. So starting Sept. 26, we’ll be doing classic films once a month, which is great, as I’m always looking to get more film students and younger generations interested in classic cinema. I’m encouraged when I see guys bringing their dates to the theater; I really want to get younger people involved. So right now, the Pickwick series is sort of like a trial run, but I’m confident that we’d do well. I’ll also be continuing my film series at the library while the Pickwick thing is happening, so I’ll have two film programs I’ll be doing at the same time. The Bugle: Digital cinema package projectors that are now the industry standard have made many first-run film houses move away from screening 35-millimeter film prints. Are the classic films screened at the Pickwick going to be screened digitally or will they be using film projection, what led to that decision? MH: To begin with, it’s going to be digital projection, but what I want to do is eventually move to a 35 mm projector. I think The Pickwick still has one 35 mm projector but has since removed it. I would like Pickwick series to be successful enough that we can get two of those 35 mm projectors going, that way we can screen archival films. But in order to do that I need to show that there is a demand for it. Once that happens, then we can do more than just digital screenings. MH: When I screen the films in the library, I always do an introduction. I like to put the film in context and give a little history on the story of the film’s production. One of the nicest comments I ever got from an audience member was that it was like taking a movie history course for free. I really go out of my way to give a nice presentation that includes giving people a heads up of what kinds of tidbits or cinematography to look for in the film. I’m going to try to do that in the Pickwick series before the film, but it won’t be to the same extant as I do at the library. At the library, I also like to show documentaries about the films we’re going to be seeing as well. Now I’d like to do that at the Pickwick I don’t have time, so that series will feature a much shorter talk. … similar to what my friends do at the Northwest Chicago Film Society. … I just want to get people excited about these films. I’m grateful for all the support I’ve gotten with that so far. The Bugle: What got you interested in classic films? MH: I grew up with them. When I was 6 or 7, I used to watch Rich Koz’s “Son of Svengoolie,” so I’ve always gravitated towards the older films, the ones my dad liked to watch. When I was in high school, I used to go to movie conventions, and when I went to Columbia College I was a film student before I eventually became a fiction writer. It was my film background that helped me get the job at the LaSalle Theatre. Talking about my experiences is great, but what makes it so cool is that I get to book films that I want to show, films that I want to get other people excited about. At the library a few years ago I screened a pre-code cinema series. It was cool seeing people react to the films and there was one that really got people talking: “Three on a Match” (1932) starring Ann Dvorak. Dvorak isn’t really that recognizable a name, but people were amazed by her performance in that film. So I’m always trying to work lesser-known films into the screenings and talk about why they are important and still relevant today. The Bugle: What is one of your favorite films or genre? MH: The 1933 version of “King Kong.” I was actually at a digitally restored theatrical screening of it Sept. 3. Nick Digilio’s Film Club at Muvico in Rosemont hosted it. I was telling him how it’s one of my favorites. Basically I’m a big fan of the classic horror genre, the Universal Films from the 1930s. I’m also a big fan Lon Chaney, star of the 1941 version of “The Wolf Man.” That’s my forte, films from the 1920, the 1930’s and 1940s. I see modern films as well, but my strength is that period of film history, so I want to stick with that era. The Pickwick series will eventually be showing some lesser-known films, but to start, we want to show films families and people are familiar with. For Halloween, we’ll be showing “The Blob” (1958) starring Steve McQueen, and we’ll be encouraging people to come dressed up in costume. In November, we’ll be showing silent film “The Thief of Bagdad” (1924) and have organist Jay Warren of the Silent Film Society of Chicago providing live musical accompaniment. Warren will also perform prelude music before we screen “20,000 Leagues Under the Sea” (1954) on Sept. 24. The Bugle: Will you have a Christmas-themed series? MH: “Babes in Toyland” (1934) staring Laurel and Hardy will be one of our Christmas tie-ins. I didn’t want to show one everyone had seen like “White Christmas.” Another one will be the silent short “Big Business” (1929) that features Laurel and Hardy trying to sell Christmas trees in mid-summer in Los Angeles. Then for 2014, I’ll be profiling films from the year 1939, which has long been considered Hollywood’s greatest year and featured the release of films like “Gunga Din” (1939) and “Gone with the Wind” (1939). It will be the 75th anniversary of films from that year, so I definitely I want to feature them at the Pickwick next summer. I’ll also have some special guests next year like Jessica Rains, the daughter of actor Claude Rains, at a screening of “Mr. Smith Goes to Washington” (1939). Her father was nominated for Best Supporting (Actor) for his role as Senator Joseph Paine in the film. I’d like to bring in other guests as the series continues once it hopefully gets off to a good start. September 26 | “20,000 Leagues Under the Sea” (1954) | With prelude music by Jay Warren of the Silent Film Society of Chicago. November 21 | “The Thief of Bagdad” (1924) | With live organ accompaniment by Jay Warren of the Silent Film Society of Chicago. The Pickwick Theatre is open every day of the week with early matinee times Friday, Saturday and Sunday and every day during the summer. Admission is $5 for everyone at or before 6 p.m. and for children under 12 and senior citizens 65 and older. After 6 p.m., general admission is seven dollars. Admission is $7 ($5 for seniors). All shows start at 7:30 p.m. Doors open at 7 p.m. For more information, visit www.parkridgeclassicfilm.com.